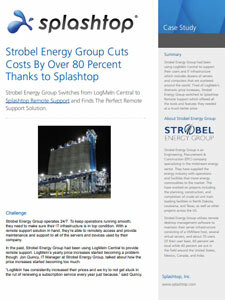 Splashtop costs less and has the same top features found in LogMeIn Central. Tired of big LogMeIn price increases? Save anywhere from 70% to over 80% compared to LogMeIn Central with Splashtop! If you want just the Base Plan features found in LogMeIn Central, you can get all the same top features in Splashtop Remote Support Plus. Compare the pricing between LogMeIn Central Base Plan vs. Splashtop Remote Support Plus and save at least 70% when you choose Splashtop. To get all the monitoring and management features found in Splashtop Remote Support Premium, you would need to get the LogMeIn Central Base Plan, and purchase all three add-ons. Compare the price between Splashtop Remote Support Premium vs. what your cost would be with LogMeIn, and save at least 70% when you choose Splashtop. Already have a LogMeIn License? LogMeIn Guaranteed Savings & Early Start Program: No need to wait until your current subscription expires. Our team will help you get an early start with Splashtop, at no extra cost. Complete this form to activate the guaranteed savings and early start on your Splashtop account. Or contact us at sales@splashtop.com or 1-408-886-7177 if you have questions. Operation hours: 8am – 5pm PST (Monday – Friday). LogMeIn has consistently increased their prices and we try not to get stuck in the rut of renewing a subscription service every year just because… We found [a vendor] had dropped LogMeIn for Splashtop due to price. We tried the software out in a free trial mode and were pleasantly surprised. Splashtop has the features we need and the price was more in line with what we would like to pay.